I have a zombie survival plan. I know the easiest ways to incapacitate the living dead. If need be, I know which of my friends and family have the most fortifiable houses and which ones will probably be turned before I could even reach them. 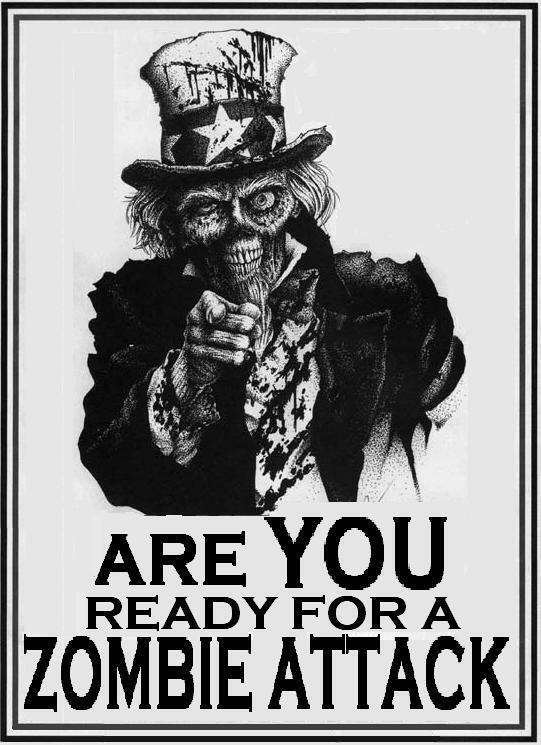 The scary thing is, my own home isn’t very safe when the eventual zombie apocalypse comes. Now that you know this about me, it should come as no surprise that FEED by Mira Grant, the horror pen name of author Seanan Mcguire, is now one of my favorite novels I’ve ever read. Like most stories about how I found a book, this one starts with me wandering around the science fiction section of Barnes & Noble, looking for that cover that catches my eye. I wanted a zombie book, but I didn’t want was something that was like every other post-apocalyptic story out there. 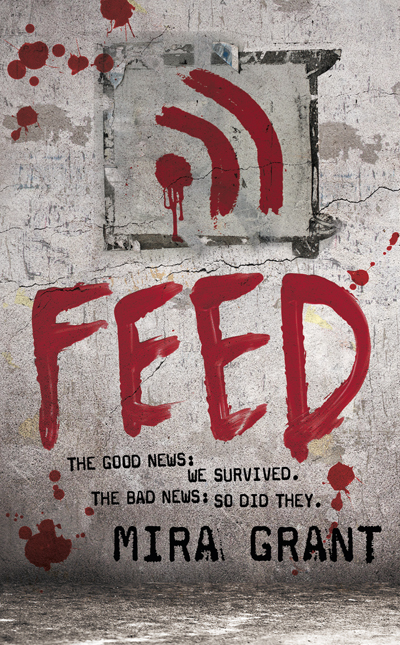 What I found was FEED, a book set in the not too distant future, where the zombie apocalypse has arrived, but is more contained and under control that you might think. Georgia (George) and Shaun Mason are twins who run their own blog sites, which are the main source of news in 2039. Along with their friend Buffy, they report on life with zombies, shoot video from cities and towns that are still overrun with the undead, or in Buffy’s case they write poetry and stories to take your mind away from the possibility that someone may burst through your front door to make you dinner. In my opinion, a great zombie story isn’t just about the gore and the feeling of dread you get from the prospect of being someone’s snack. It’s about the people. FEED’s characters are lively, humorous, and believable in every aspect. The story itself is something I’d never expect from a zombie tale, as it involves the Mason’s and Buffy becoming the official press team for a new Presidential candidate as they follow him on the campaign trail and a political thriller ensues. It’s like JFK with Zombies. Like all good books, I took my time reading it, usually a chapter or two a night. I was so caught up in it I didn’t want these characters to leave my life. I even began to picture them in my mind, and went so far as to assign Caprica’s Allessandra Torresani the role of George. 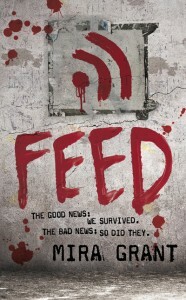 If you can, go out and pick up FEED at your local book store or buy it digitally. Book two from the NewsFlesh Trilogy, Deadline will be released next month on May 31 in paperback and digitally. While researching the other day for when Deadline was going to be released, I came across a Mira Grant short story available on my Kindle. Apocalypse Scenario #683: The Box, is a short story about a group of friends who have gathered together every Friday night for 15 years to play the Apocalypse Game. 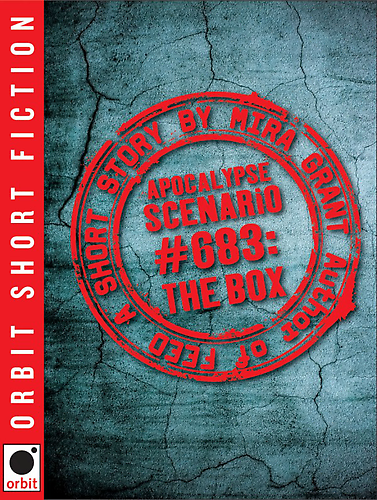 Each week someone presents a scenario about the end of the world, and the friends must discuss and provide solutions for how to save it, only this time one friend doesn’t show up and “phones in” her Scenario, entitled #683: The Box. I like to think that I don’t let stories, movies, or anything like that bother me. It can be as gorey, disturbing and messed up as humanly possible and I can move on when it’s over like nothing ever happened. This short story left me feeling kind of sick in the head, as it became so F’ed up and disturbing that I was actually smiling at how crazy it was. 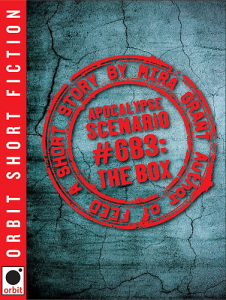 Apocalypse Scenario #683: The Box is available through Amazon for your Kindle at only $1.99 and is worth the read. 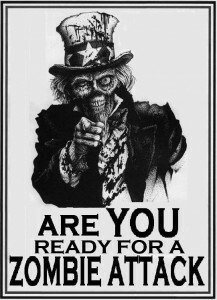 PETER loves a good zombie story & because of FEED & Apocalypse Scenario #683, he absolutely cannot wait for Deadline. In fact, he’ll probably pick up some of her fantasy books as well. He also has several different survival plans for when the dead come back, and he believes you should as well.